My first encounter with a Common Sootywing (Pholisora catullus). A new butterfly, one I’d never seen before. Exciting. We were in Eastern Neck National Wildlife Refuge in May 2014. She was basking on a leaf, taking in the Delmarva’s warm morning sun. My calculated approach was good, she tolerated 5 film exposures, then she was gone. Me, I was bubbling with excitement. What was this rare little skipper, how rare, that I hadn’t seen one in the last 14 years? Back to the Sailor’s Motel in Rock Hall. Flip open my field guide . . . Huh? 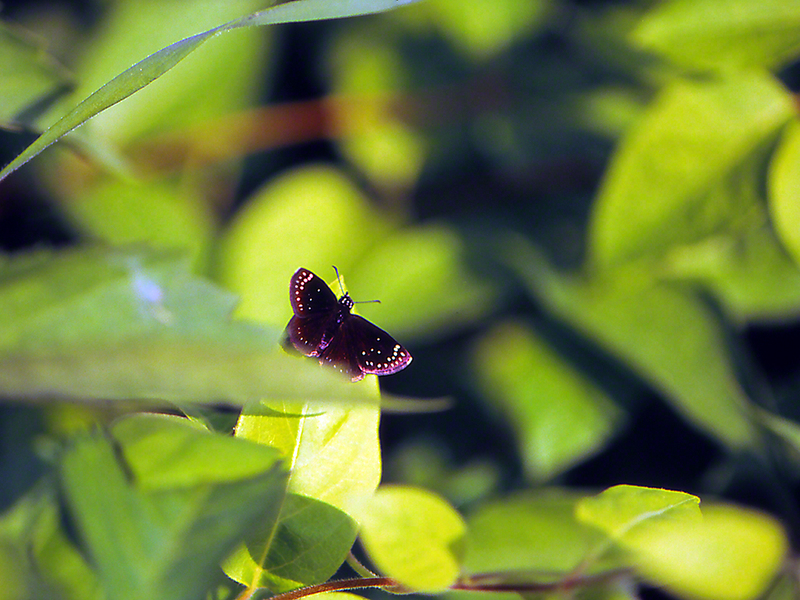 The Common sootywing. Not rare at all, and found west of the Mississippi, east from Maine to Florida. She was this glossy black. Her white spots were bright white. Several field guide authors argue that her given name is too colorless for such a starkly beautiful little wonder of a native butterfly. Their hostplant is that ‘weed’ that all eastern gardeners have pulled hundreds of times, Lamb’s quarters. Ha! Ms. Sootywing is indeed to lovely to be common! I sure didn’t know that Lamb’s quarters is the host plant, but I remember learning about this butterfly. Love your photos and the info you share about the subjects. Keep it up. I, too, enjoy taking photos of nature, mostly flowers and vegetables, trees, aniimals. I am thrilled when I ‘catch’ a butterfly or bird.